Teaching your dog good leash manners is vital if you want to avoid a game of tug-of-war every time you go out for a stroll. Dogs are naturally inclined to go on ahead and explore with their noses, but if their will to sniff everything in sight is wrenching your arm out of its socket on the daily, it’s time to take back control of the lead. It is possible, but it will take some training and, in the long-run, you’ll be happy you dedicated the time and energy to it, when you’re out enjoying a relaxing walk without all the pulling. Find somewhere your dog isn’t going to be distracted. Your back garden is the best place to start training as there are going to be fewer distractions than a busy park, for example. To retain your dog’s concentration, aim to keep initial training sessions short. Ideally, keep them between 5-10 minutes. Any longer than this and you run the risk of losing your dog’s focus and willingness. To encourage responsiveness, try to train when your dog is slightly hungry. Choose some treats that you know your dog enjoys and that can be easily carried with you. Invest in a harness rather than a collar, as collars reduce your control and are harmful to a dog’s neck. Halter-style harnesses fit around the muzzle and back of the head, with the lead attaching under the chin. In this style of harness, your dog will quickly learn he needs to walk alongside you in order to walk in a straight line. 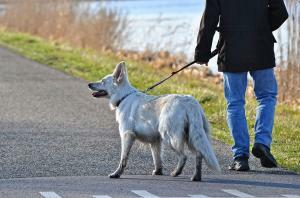 Find a quiet place to train and start by asking your dog to sit next to you, with his shoulder in line with your leg. Show your dog that you’re holding a treat, as this will immediately focus his attention on you. As you walk, if you find your dog trying to race ahead or get in front of you, turn around and go back to your starting point. Repeat the process of stepping forward and saying ‘heel’, as well as the process of turning back every time your dog surges forward. When your dog is walking in line with your leg, repeat ‘heel’ and reward him with a treat. Initially, reward him every time he stays in line and walks by your side, but as he starts to learn, get him to walk for longer periods before offering a reward. Remember that rewards don’t always have to be treats; petting and praise will also show your dog he is doing the right thing. If you have any advice of your own, please comment below and share it with our other readers. I totally disagree with using a harness. These are designs to encourage dogs to pull without any consequence. You are unable to control the dogs head to encourage him to walk forward which allows him to spin and twist at will. I betyou also encourage the use of extending leads or long leads, which also encourages the dog to pull to distance itself to do what it wishes. I personally do not allow my dogs ,all 5 (on metre leads and collar, to walk ahead of me while they are on lead. I also walk with 2 walking sticks and invested time in training each dog to walk correctly. Their reward is running off lead. My dogs are all rescues and adults with major lead problems when I took them on. At times it has taken me 3 months to train. I have used gentle leaders as a training aid at times.